After painting my studio walls, the floor (previously painted black) started to look really tired. Especially since I have a tendency to splatter paint all over it. So, I decided to paint it a creamy white, and perhaps start using a drop cloth. Ya think? As I started to put some of my recent finds back in the room, I noticed I had a nice complimentary vignette going. 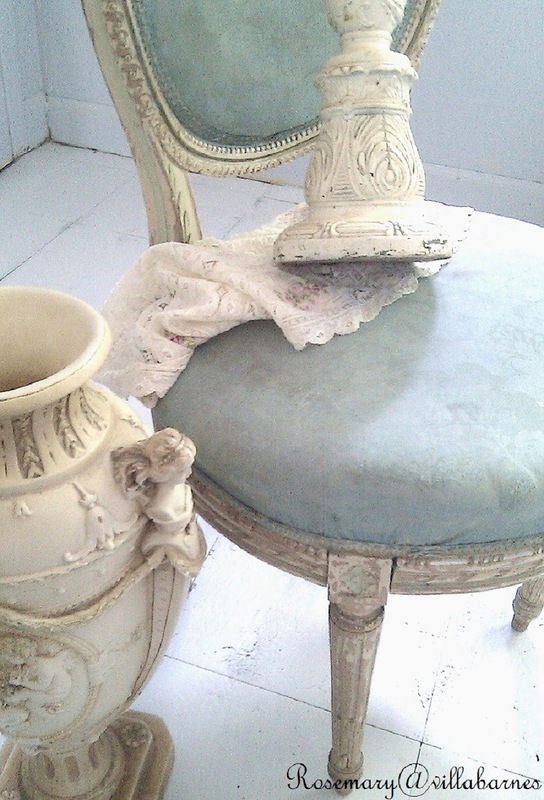 The chair from my "Focused Finds" post was given a very quick makeover. Remember how it looked before? I found some milk paint I forgot I had. Yes, even after lots of purging in the abyss, I'm still discovering stuff. I gave the fabric a coat of spruce blue. I didn't do multiple coats, because I wanted to maintain a worn look. After it dried, it was surprisingly soft. I had no intention of touching that fantastic frame with the original painted finish. I think the blue compliments it well. 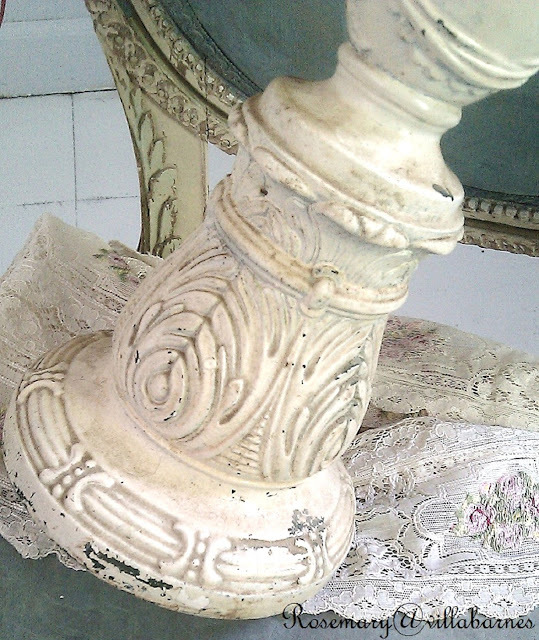 My other recent find, the vase, looks like it could have come from the same house. So does the lamp I found this weekend at the flea market. 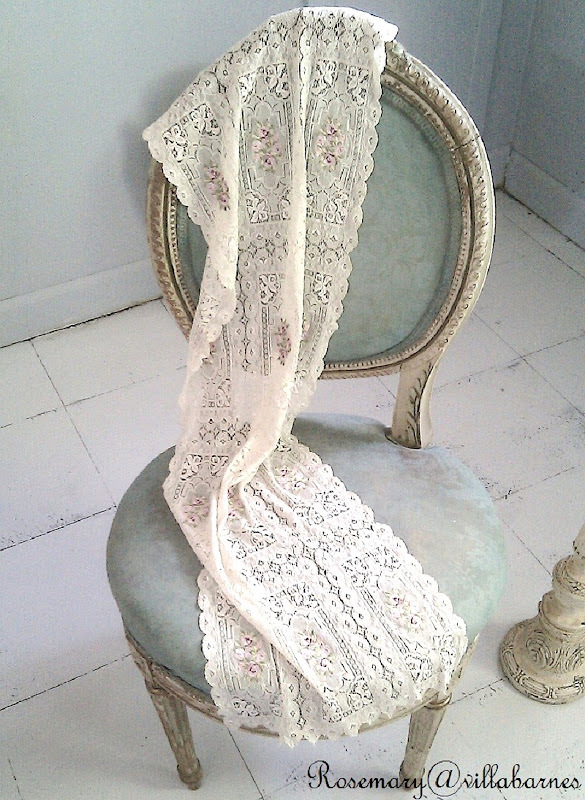 Everything works so well together, including the lace runner (a garage sale find). 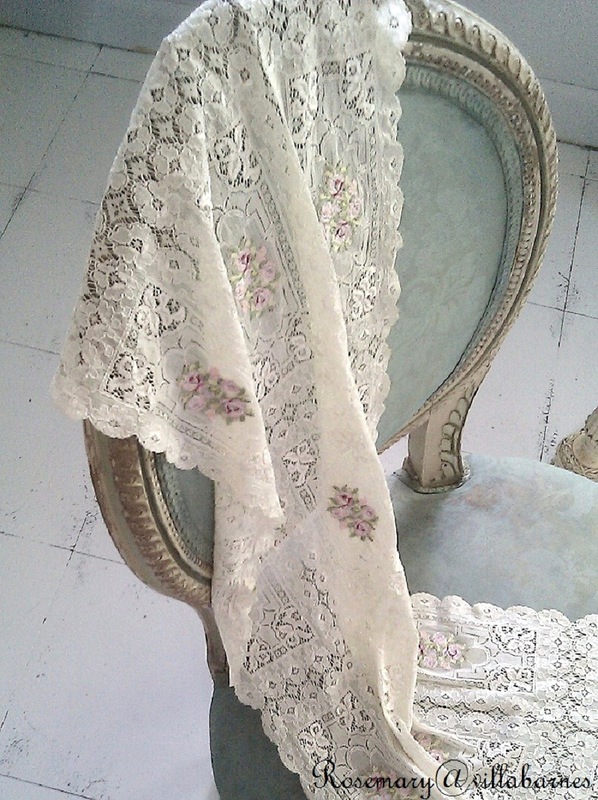 It's very delicate, in great condition, and has beautiful rose details. I'll share some of my other finds this week. Rosemary, I haven't been able to visit in awhile; but, I see you are still creating and making amazing pieces. The chair looks fabulous! Beautiful vignette! Love the blue of the chair. Beautiful chair. So cool that you painted the fabric. All of those pieces are beautiful Rosemary and they work perfectly together. I would love to have that blue chair in my bedroom! 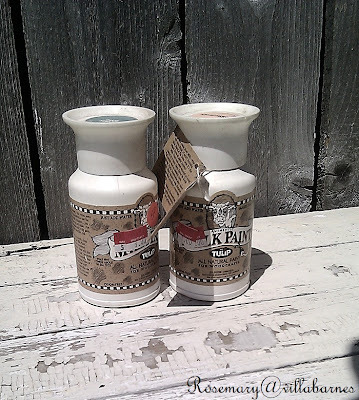 Can you believe I just found that exact same milk paint in my craft closet? I must have bought it more than 10 years ago. The color is called putty. I'm going to paint a couple of urns for my porch. They used to paint barns with milk paint so I guess it will hold up. Always a pleasure visiting you. I love what you did with this chair! Painting the fabric was genius! It turned out so well. Love the lamp and the runner, too. Very inspiring! I had a little giggle about the drop cloth! 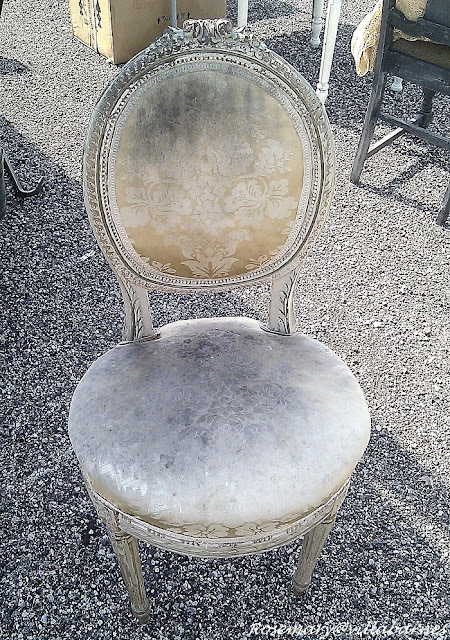 Beautiful chair Rosemary! I love that you painted the fabric. Rosemary that chair is beautiful!! Love this painted seat cushion! I would love to try this myself.What a great option to recovering. I love how the chair turned out! Your vision blows me away every time! That chair is amazing! What did you use to cover the chair? I picked up the gesso from micheals today. Thanks"
Rosemary, this vignette is so pretty! I am never disappointed with eye candy when I come to visit. I love your work! Wonderful vignettes. You have such creative flair. Your chair turned out wonderfl, my friend! You are so talented! Enjoyed the post! That chair so gorgeous--the color is so so pretty! That chair is stunning, Rosemary! I love it! I did think you painted the frame of it ~ the Spruce color really makes it stand out beautifully. 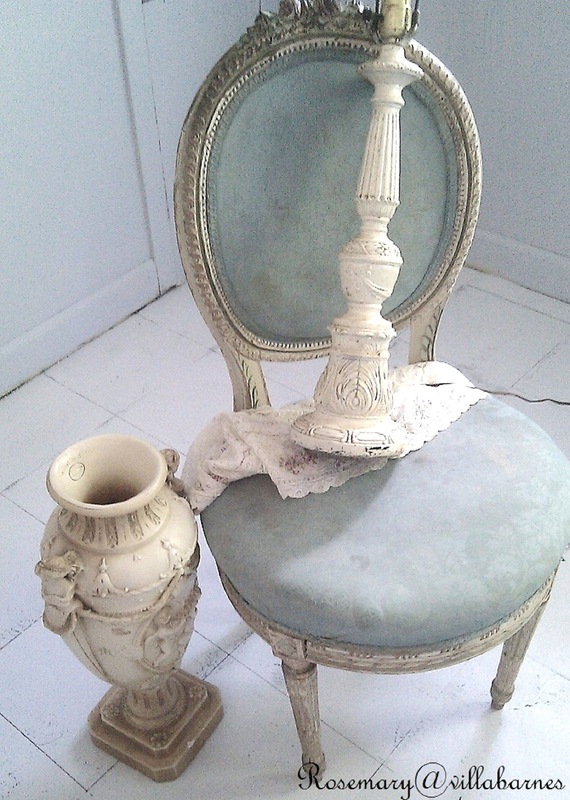 All those finds make for such a pretty vignette together. I've been following you for a long time now - love love love your creations but this one makes my heart melt! 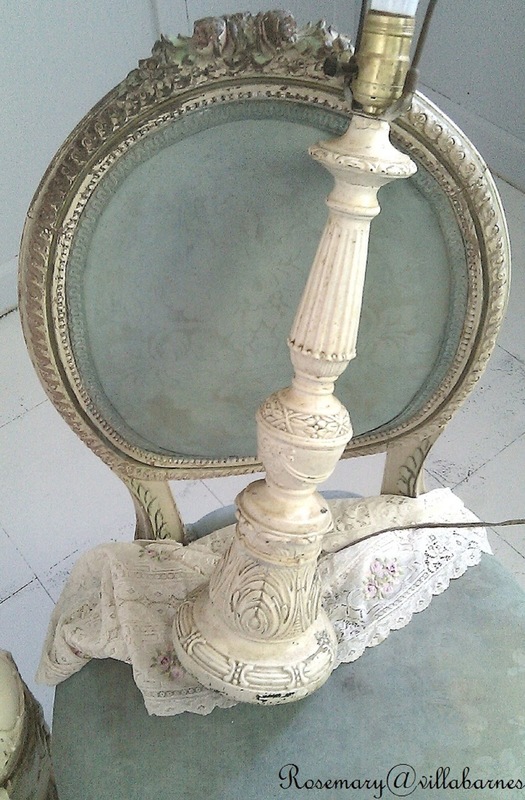 Speaking of French design, be sure to stop by and take a peek at my "French-inpired" giveaway. There are only three more days to enter. You are singing my song with these colors! Exquisite. Such a pretty color on the chair. I love that you painted the fabric. It turned out really well. Ok got it! Milk paint. I think I have said this before, but I just have to say it again...all your stuff you do is just beautiful! Love the blue on the chair! Had no idea you could paint that fabric with milk paint! Very pretty! Rosemary, You inspired me to do a distressed silvery frame. I put a link back to this post on my post to give you credit. Thanks for all the wonderful ideas and sharing your beautiful creations! Check out the Chalkboard Countess if you have the time. What a beautiful chair now!! the chair looks amazing ! so all you did is paint the fabric? what kind of paint did you use? Just gorgeous Rosemary! I love the chair too. Everything goes so well together; they DO complement one another. The chair is delightful. I had no idea one could paint fabric with milk paint. Beautiful vignette. Everything goes so well together. Rosemary you have the Midas Touch! I'm so impressed by your creative eye and talent for what you do! So glad I found your blog today via Debbbiedoo's party. What a find for me! Rosemary you did an amazing job on that beautiful chair...love the lamp and table runner too! Can't wait to see the room & thank you for all the inspiration!! Great finds I love the chair it is so cool and the lamp is great too. Heck I love everything. Following you now via linky I always love your stuff. Beautiful vignette, Rosemary! The chair transformation is amazing. Its absolutely gorgeous Rosemary. LOVE LOVE LOVE your chair!! Thanks for linking up! Wow! I have an old sofa that I'd love to try this on. Your chair turned out beautifully!